Forced to run from the Texas Rangers after a heated misunderstanding leads to the death of a lawman, Mexican American farmer Gregorio Cortez sets off in desperate flight, evading a massive manhunt on horseback for days. Producer-star Edward James Olmos, seeking to shed new light on a historical incident that had been enshrined in a corrido (folk song), enlisted director Robert M. Young, a longtime practitioner of socially engaged realism, to helm this trailblazing independent film, a landmark of Chicano cinema. Shifting its perspective between the pursuers and the pursued, The Ballad of Gregorio Cortez is a thrilling chase film and a nuanced procedural that peels away the layers of prejudice and myth surrounding Cortez, uncovering the true story of an ordinary man persecuted by the law and transfigured by legend. Never seen or heard of this film but being a western, I'll certainly preview it on Film Struck and maybe pick up the release later. Well it only has 88 votes and 50% of those are from users over the age of 45, so I'd be surprised if anyone here has heard of this film. All I know is it's the same guy that made ¡Alambrista! swo17 wrote: All I know is it's the same guy that made ¡Alambrista! Anyway I'm glad to see a lesser film like this get a release. I love Westerns and this sounds like something I'll enjoy. Olmos was really passionate about it and I hope it shows. Apperson wrote: Well it only has 88 votes and 50% of those are from users over the age of 45, so I'd be surprised if anyone here has heard of this film. I’ve seen it, and may have it on VHS somewhere. I’m a half Mexican and Jewish kid from the Southside of Chicago-so that may be part of the reason I know of it...They showed it a lot of Spanish classes in the 90s, plus my grandfather was a big western junkie. I feel like this was a two pack VHS with Quiggly Down Under for his birthday or something. I can’t say I really expected this film to get such loving treatment. Certainly relevant in today’s political climate. If anyone goes off on a Olmos kick, the TV movie adaptation of Dead Man’s Walk from Larry McMurtry would make a wonderful companion viewing. As I said, I can’t imagine I ever thought this would be in the collection, or that I’ve thought about it since the 90s. But it’s a pretty nice woodcut technique on the cover. 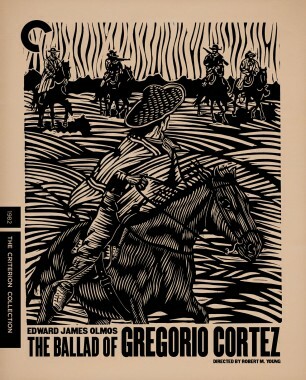 I saw The Ballad of Gregorio Cortez at Cinema 21 in San Diego CA when it was first released and was so knocked out by it I went back to watch it three times. Superior cinema on every level, and incidentally, one of the greatest westerns ever made. It's The Grapes of Wrath of westerns. Sounds intriguing! I think I can cope with the electronic score. It seems very much of that era, and I do wonder whether the Vangelis score for Chariots of Fire had any influence? After all that was used just as incongruously/anachronistically there and became celebrated. I enjoy the fact that the composer scored this film in between doing the scores for Enter the Ninja (’81) and Revenge of the Ninja (’83). I didn't realize Olmos was a musician, as he had a hand in doing the score too. Interesting (mildly so) that Jon Brion is in this too, and this came out the same year as Blade Runner. flyonthewall2983 wrote: I didn't realize Olmos was a musician, as he had a hand in doing the score too. Interesting (mildly so) that Jon Brion is in this too, and this came out the same year as Blade Runner. I think you mean Brion James. Since the last few posts were about the score, I momentarily thought that an 18-year-old Jon Brion had managed to contribute to the music! Getting my BJ's confused it seems. Thank goodness Criterion picked this up. I can see how this would play far better in a theater as Olmos said. But it's fairly unforgettable and, as bearcuborg stated, apropos to the current political climate. I like the nod to Rashomon in terms of narrative technique though it goes further in terms of visual repetition: Young literally attempts a film equivalent of a ballad. I'm not sure if High Noon is on this level. I too am glad Criterion picked up this forgotten gem. The only thing that doesn't hold up well is the electronic score (which was popular in movies of this time). Fortunately the electronic score is limited in parts and doesn't flow during the entire movie. On a humorous note, whenever the electronic score was playing... I kept expecting to see some runners from "Chariots of Fire" running somewhere across the desert landscape. Just a curious question... What are your thoughts on the spanish language dialogue scenes without subtitles and how many of those scenes are there? There are a few... but I understand a little Spanish... and that which I didn't understand, I could figure out what was basically being said based on what was going on. Well, part of the point in not subtitling the Spanish language scenes was to put the viewer, particularly those who are not fluent in Spanish, in the mental framework of the sheriff and his cohorts who confronted Cortez and his brother, misconstrued their responses and reacted violently. In fact, the consequences of acting on misinformation throughout the film, not only from that initial confrontation but from the ensuing versions of what happened to the courtroom trial is part of what the filmmakers attempted to convey. Initially, I had that same reaction to the very 80s sounding soundtrack. But once I got into the film it began to grow on me and even enhanced parts of the story - in much the same way as Midnight Express did. It also has very distinct synth score to support a similar sort of nightmare journey into the heart of a legal system skewed against the main protagonist. Perhaps the implication is a bit pat but you can't deny that both films place the central character in the position of the underdog. I mean, it ain't The Ballad of the Texas Rangers. Thanks Ando, I’m familiar with why they left out the subtitles. Just want to know how you as a viewer felt not knowing what was being said. It reminds me of some of those American war films that had Japanese military with dialogue but no subtitles. That always frustrated me and thought the filmmakers were lazy. I know the intent here is different. Ah. Well, I understand basic Spanish. But I didn't know a caballo from a yegua before I watched this film. I'd bet that most Americans aren't aware of the difference (in terms of the language) as well. But that's an (probably incorrect) assumption. Living in a city like New York where you hear all kinds of languages all the time you look out for other signals of intention (body language, tone of speech, situation, etc.) before you respond - if you do at all. Given the current climate of general paranoia and suspicion now I'd say the rest of the country is moving in that direction despite reading tragic knee-jerk reactions between people of presumed differences every day. When I pick up the Ambersons Tuesday I'm going to blind buy this. The reviews have been pretty positive.